We investigate the molecular and cellular mechanisms of development in the nematode Caenorhabditis elegans. Currently, we focus on three aspects: regulation and developmental functions of (1) cytokinesis and (2) autophagy, (3) morphogenesis of the C. elegans head. We use a combination of transcriptomics, proteomics, conditional mutants, reverse genetics, time-lapse microscopy, laser-micromanipulation, and image analysis/bioinformatics to decompose complex processes into their cellular and molecular constituents. Activities in the lab are part of and/or funded by: DFG EXC 115, DFG FOR 1756, LOEWE Ub-Net ('Landes-Offensive zur Entwicklung Wissenschaftlich-ökonomischer Exzellenz'), Marie Curie Actions. Our group is part of GENiE (Group of C. elegans New Investigators in Europe, http://www.worm-genie.eu). 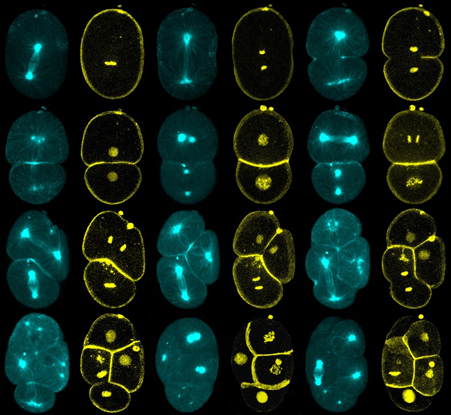 Figure: Time-lapse imaging of the first three rounds of division in early C. elegans embryonic development. Microtubules and non-muscle myosin II are shown in cyan, the plasma membrane and chromatin are shown in yellow.